I thought I should post this – it covers how many food and diet lies got started and how the proof, the studies are flaky or non existent. 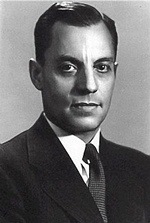 In the year 1958, an American scientist called Ancel Keys started a study called the Seven Countries Study, which examined the association between diet and cardiovascular disease in different countries. The study revealed that the countries where fat consumption was the highest had the most heart disease, supporting the idea that dietary fat caused heart disease. Countries where people eat a lot of fat but have little heart disease, such as Holland and Norway. Countries where fat consumption is low but the rate of heart disease is high, such as Chile. Basically, he only used data from the countries that supported his theory, a process known as cherry picking. This highly flawed observational study gained massive media attention and had a major influence on the dietary guidelines of the next few decades. 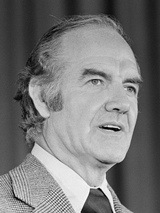 In 1977, an American committee of the U.S. senate led by George McGovern published the first Dietary Goals For The United States in order to reverse the epidemic of heart disease in the country. These guidelines received massive criticism at the time from many respected scientists like John Yudkin (who insisted that sugar was to blame) and the American Medical Association. Less refined and processed sugars. More complex carbohydrates from vegetables, fruits and grains. These guidelines were picked up by the USDA (United States Department of Agriculture) – very convenient for them since their job is to sell grains. 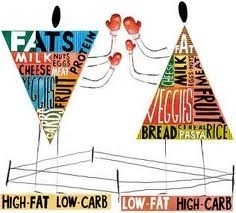 Basically, a low-fat, high-carb diet… for everyone. The whole guidelines were based on observational studies made by biased scientists and had nothing even closely resembling scientific proof to back them up. Since then, many randomized controlled trials have shown that this dietary approach doesn’t really work for the people it was meant to help. An interesting fact is that the obesity epidemic started around the time these guidelines were published and the diabetes epidemic followed soon after. It is important to realize the massive significance of this. This idea that saturated fat caused heart disease was the cornerstone of modern nutrition policy and the reason health authorities turned away from a higher fat diet rich in animal foods, towards a low-fat, high-carb diet with plenty of grains. Even though saturated fat has now been proven to be harmless, modern nutrition is still stuck in that same paradigm based on cherry picking, lies and just plain bad science. Nutritionists are still preaching the low-fat, high-carb dogma that has pretty much been proven to be ineffective for the majority of the population and may even be downright dangerous for some people. Since the year 1977, the health authorities have told everyone to eat a low-fat, high-carb diet. This was originally based on political decisions and low quality studies that have since been thoroughly debunked. Interestingly, the obesity epidemic started at almost the exact same time the low-fat guidelines first came out. In the UK fitness ‘Gurus’ like Rosemary Connolly founded a Lo-Fat empire- about as ineffective in terms of long term fat loss as weightwatchers and slimming world (5% over 18mths). Since then, several massive studies have examined the health effects of the low-fat diet. In the Women’s Health Initiative, the biggest study on diet ever conducted, 48,835 women were randomized to either a low-fat diet or continued to eat the standard western diet. After a study period of 7.5 years, the low-fat group weighed only 0.4 kg (1 lb) less and there was no decrease in cardiovascular disease or cancer (68, 69, 70). Other studies agree with these findings… this diet is notoriously ineffective (71, 72). Even though it may work for healthy and active individuals… for people with obesity, metabolic syndrome or diabetes, the low-fat diet can be downright harmful. Bottom Line: The low-fat, high-carb diet recommended by the mainstream nutrition organizations is a miserable failure and has been repeatedly proven to be ineffective. 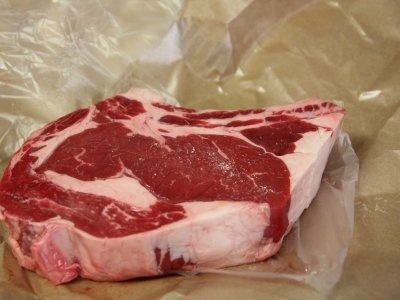 Many people believe that eating a lot of protein can damage your bones. While it is true that increased protein can increase calcium excretion from the bones in the short term, the long term studies show the exact opposite effect. In fact, eating more protein is consistently associated with improved bone density and a lower risk of fracture in old age (27, 28, 29). This is one example of where blindly following conventional nutrition advice will lead to the exact opposite result. Another myth is that protein increases strain on the kidneys and contributes to kidney failure. The reality is a bit more complicated than that. Although it is true that people with established kidney disease should reduce protein intake, studies in healthy individuals show that protein is perfectly safe (30, 31). In healthy individuals, protein actually reduces two of the main risk factors for kidney disease… which are diabetes and high blood pressure (32, 33, 34). Eating a high protein diet has many other benefits, including increased muscle mass, reduced body fat and a lower risk of diseases like cardiovascular disease (35, 36, 37). Bottom Line: Studies show that protein has positive effects on bone health in the long run and does not raise the risk of kidney disease in healthy individuals. 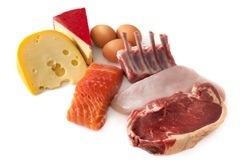 Eating a high protein diet has many important health benefits.